The Yocha Dehe Wintun Nation Tribal Council is the governing body of the Tribe. The Tribal Council consists of five members who are duly elected for three-year terms by the full Tribal Community Council, which includes all qualified voters 18 years and older. The Yocha Dehe Tribe is a sovereign Native American nation and is so recognized by the United States. Operating under the Tribe’s own constitution and bylaws, the Tribal Council enacts laws that govern its own sovereign lands and enterprises. The Tribal Council oversees all areas of the tribal government and its business enterprises, evaluating and making final decisions with respect to the recommendations of the Tribe’s various departments and committees. 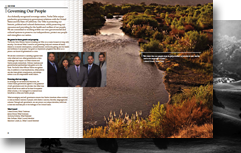 Tribal committees, boards of directors and commissions operate all areas of government and community life. These include the Yocha Dehe Wintun Academy, Yocha Dehe Fire Department, Yocha Dehe Community Fund, Yocha Dehe Farm and Ranch, Cultural Resources Department, Health and Wellness Department, Environmental Department, Tribal Gaming Agency, and Cache Creek Casino Resort. The Tribe enjoys a productive government-to-government relationship with the State of California and Yolo County. As the Tribe’s governing body, the Tribal Council negotiates government-to-government agreements with the State, the County and local agencies. To date, these agreements govern the Tribe’s entertainment and hospitality operations, and provide the State and County with fire, police and transportation infrastructure improvements throughout the region. In 2003, the Governor of California bestowed the Tribe with the State’s highest and most prestigious environmental honor, the Governor’s Environmental and Economic Leadership Award, in connection with its civil services agreement with Yolo County. The Tribe is also a signatory to an unprecedented Fire Mutual Aid Agreement. For the first time in Yolo County history, the Tribe’s fire department is a contributing member of the County’s emergency response force.